David's Father is an English original, written by Robert N. Munsch and illustrated by Michael Martchenko. 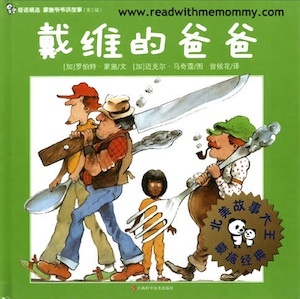 This book is the chinese translated version. When David moved to the neighborhood, Julie was afraid of David's father because he was a giant. David, who was adopted, is not a giant and looks like a regular kid. When Julie got to know David's father, she found out he was very nice after all, but still kind of scary. "You think he is scary?" asks David. "Wait till you meet my grandmother." A super humorous book about family interaction. Available in hard cover and in simplified chinese. There is no hanyu pinyin in the book. For reading to the child, this book may suit children of 5 up. For self-read, this book would be recommended for children of 9 up. Munsch's wife delivered two stillborn babies in 1979 and 1980. Out of the tragedy, he produced one of his best-known books, Love You Forever. This book was listed fourth on the 2001 Publishers Weekly All-Time Best selling Children's Books list for paperbacks at 6.97 million copies.